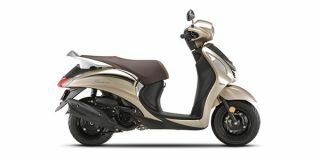 Yamaha Fascino price starts at Rs.55,123 (Ex-Showroom, Delhi) and the top end variant Yamaha Fascino Darknight Edition is priced at Rs. 56,793 (Ex-Showroom, Delhi). The Yamaha Fascino is powered by an air-cooled, single-cylinder 113cc engine which develops 7.1PS at 7500rpm and a peak torque of 8.1Nm at 5000rpm. The scooter gets an underbone-type chassis with telescopic suspension at the front and a monoshock unit at the rear. It gets drum brakes on both the ends and the 10-inch steel wheels have been wrapped with tubeless tyres both at the front and rear. Fuel tank capacity stands at 5.2 litres, and since it employs fibre panels, the scooter tips the scale at just 103kg. Share your experiences with Fascino? The new Destini 125 is better than that .. look for it too, its extremely comfy ! Q. Is there any modifications in 2019 model? No, Yamaha Fascino hasn't get any update in 2019. Q. Can we can charge mobile or Bluetooth in this? No, Yamaha Fascino isn't packed with mobile charging point feature. Q. Any vehicle with digital speeds meter?